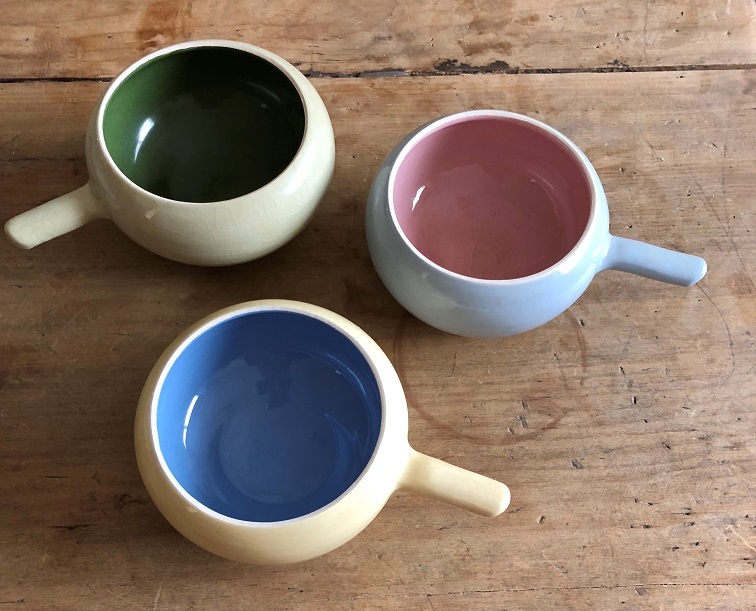 This pottery is instantly recognisable from the edge band of unglazed pottery, that always separates the two toned pieces. All Martin Boyd pottery was made [and signed] by hand, so there is a slight variation between any pieces in a set. Guy Martin Boyd (1923-1988) was born in Murrumbeena, Victoria, where he learnt to make pottery as a child in the studio of his father Merric Boyd. Guy trained as a sculptor at the East Sydney Technical College. In 1946, to help fund his studies, he set up the Martin Boyd Pottery in Cremorne with partners Norma and Leonard Flegg. In 1951, he sold his share of the pottery to Leonard’s brother Ronald and returned to Melbourne, setting up the Guy Boyd Pottery in Bentleigh in 1952. He and his wife Phyllis operated the pottery until 1964. The Boyds are a famous Australian family of artists. Merric studied pottery at the Wedgwood Pottery and returned in 1919 to Murrumbeena, where he applied many of the techniques he had acquired in England. His pottery became highly popular. He held exhibitions and pottery demonstrations in Melbourne, and sold his pots through city stores such as Georges. He was described in one newspaper article as ‘The King of Melbourne Potters’.